George Brown College and Centennial College campuses will be closed on Tuesday morning. George Brown tweeted that child care lab centers will also be closed for the evening. All of Centennial College campuses will be closed, including Ashtonbee, Downsview, Morningside, Progress and Story Arts Center. The college tweeted that the closures include all daytime and evening classes, child care centers and other services. Campuses are expected to reopen Wednesday. The proactive closure notice came for the 15 and 25 centimeters of snow, ice pellets and possible freezing rain. "Environment Canada warned. Surfaces such as highways, roads, walkways and parking lots. "Visibility will be ever reduced. There may be a significant impact on the traffic in urban areas. " 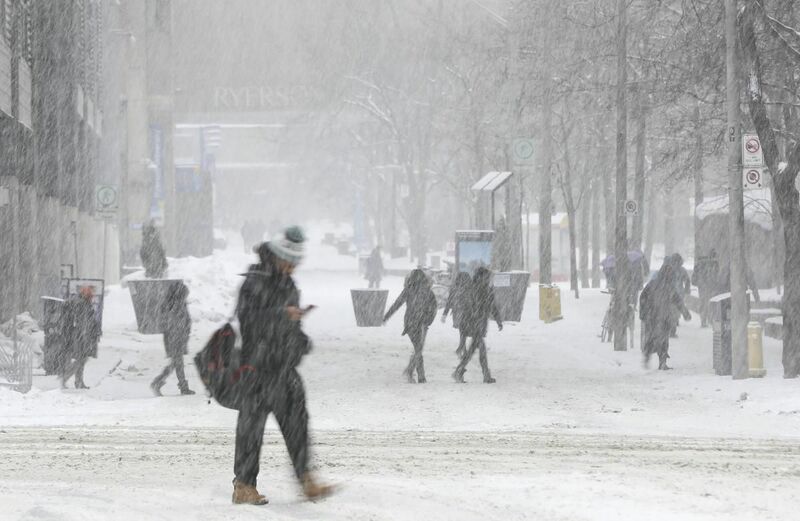 Ryerson and York Universities, as well as Humber College (including the University of Guelph-Humber), have reported 5:30 a.m. Tuesday. Durham College remains open to the weather. As of Monday night, the University of Toronto campuses are expected to be open. Pearson airport is expecting delays and cancellations.